Caterpillar (NYSE:CAT) is ranked number nine on a list of stocks that hedge funds are shorting "like crazy", according to Business Insider. The list is compiled from Goldman Sachs' Hedge Fund Trend Monitor, which looks at what hedge funds are trading along with their short positions. Business Insider says the 50 stocks it compiled are ranked according to the total dollar value of short interest. 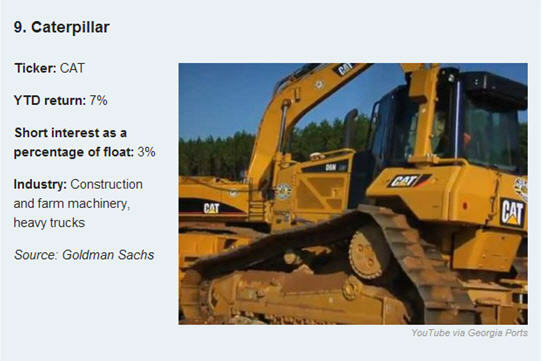 Caterpillar's short interest as a percentage of its float is 3%. The number one company on the list is Intel and number two is Exxon. Sometime Caterpillar competitor, General Electric, is number 11 on the list. Several oil and gas companies made the list, like Hess Corp. and Range Resources. There are no miners. In its recent quarterly earnings report, Caterpillar CEO Doug Oberhelman said he was worried about growth in the US and Europe.